Welcome to the Iron Neck training exercises overview! You’re here either because you are obsessed with neck training or you’ve recently discovered that ignoring your neck increases your concussion risk and can lead to deteriorating postural issues and neck pain. If you've ever seen videos of Mike Tyson strengthening his neck, you know that neck training isn't anything new. Boxers and wrestlers have done neck bridging or used head harnesses for a very long time. 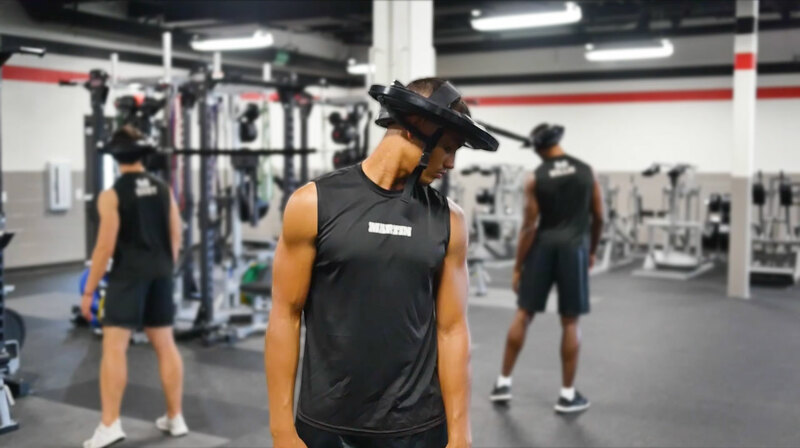 Over the past five years, as more CSCS-certified strength & conditioning coaches have implemented and experimented with Iron Neck training, we've shared a lot of the new, innovative exercises with our growing Instagram community. With the design improvements made this past year, athletic trainers, physical therapists and chiropractors began integrating Iron Neck into rehabilitation treatment programs to improve strength, mobility and core stability. By completing the Six Foundational Movements, you'll train every part of your neck, in every position. A complete workout takes less than 5 minutes and can be accomplished almost anywhere. Perform these exercises 3 times a week and you can expect to see improvements in strength and mobility within the first couple weeks. Let's get started! 360 Spin. This is a great warm up. Facing forward, keep the head and neck locked in place, then spin your entire body clockwise 360 degrees. Complete x3 reps. Then reverse directions and spin your entire body counter-clockwise 360 degrees. Complete x3 reps.
Keys to success: Keep head and neck locked in place, shoulders square, and maintain upright posture. Look Left Look Right (LLLR). Facing forward, with your head in a retracted position, rotate your head to the right, then back to the left. Keep the Iron Neck parallel to the floor throughout the movement. Complete x5 reps. Perform these facing all four directions (forward, right, backwards, and left). Keys to Success: Keep shoulders square throughout the movement, just rotating your head and neck. Try performing x8 LLLRs during a slow 360 Spin. Complete once spinning clockwise and once spinning counter clockwise. Diagonals. Facing forward, tilt your head 45 degrees to the right to get into proper starting position. Trace a line with your nose down to your right shoulder, then up to the sky above your left shoulder. Complete x8 reps. Next, tilt your head 45 degrees to the left, then trace a line with your nose down to your left shoulder, then up to the sky above your right shoulder. Complete x8 reps. Perform these facing forward and backward. Keys to Success: Keep your body as still as possible and maintain head tilt to stay on the same plane throughout the movement. Protraction-Retraction, aka 'The Turtle', aka 'The Quagmire'. Facing forward, extend your nose as far forward as you can (keeping the rest of your body still). Hold for 1 second, then pull your head back to a retracted position. Complete x8 reps. Perform these facing forward and backward. Keys to Success: Keep the Iron Neck parallel to the floor throughout the movement. Be careful not to over extend yourself in the retraction phase. Some people find it helpful to place their hand on their chest to feel better control. Try holding the last Protraction-Retraction rep facing both directions and perform x10 mini LLLRs. Figure Eights, aka 'Stevie Wonders'. Facing forward, with the head in a neutral position, trace a sideways eight (infinity sign) with your nose. Here's what it looks like broken down: 1) trace a line with your nose down to your right shoulder, 2) then up to the sky above your right shoulder, 3) then diagonally across to your left shoulder, 4) then up to the sky above your left shoulder. Complete x8 reps. Next, reverse the pattern. Complete x8 reps. Perform these facing forward and backward. Keys to Success: Keep your body as still as possible. Start with a small figure eight, then make it progressively bigger as you get the hang of it. Locked Neck Body Turn. This is a fantastic core workout! Facing forward, with the head and neck locked in place, bring your hands together in front of your chest. Rotate at the waist all the way to the right, then back to the left. Keep the Iron Neck parallel to the floor throughout the movement. Complete x5 reps. Perform these facing all four directions (forward, right, backwards, and left). Keys to Success: Keep your shoulders square throughout the movement. Some people find it helpful to put the hands in prayer position so they are about 12" in front of your face - this gives you a reference point in which to lock your eyes so you keep your head and neck locked in place. Try lowering the resistance source 6-12", get into more of an athletic stance, and perform at 'game speed'. Whether you're a coach in a big time athletic program, a physiotherapist, or an individual looking to improve their overall neck health, being able to identify and chart out progress is vital. Iron Neck gives you a way to quantify and measure neck strength. We've created a simple tracker for you to download and use. Which Iron Neck is For You? There are a few options as far as model, price and fit. Check out the Iron Neck Fundamentals blog where we help you determine which Iron Neck is best for you. Thanks to Elite FTS and Nate Harvey for the video demos. Great work...and excellent form!